Picking your perfect bathroom color scheme can be daunting. There isn’t always a lot of space to work with, and you want to choose a palette you'll love for the long haul, because remodeling a bathroom can be quite an endeavor, and isn’t always cheap! That being said, creating an inviting bathroom color scheme is important, and will feel incredibly rewarding when you know you’ve done it right. First off, it’s important to know whether you want your bathroom color scheme to be bold and daring, or if you’d prefer a room that gives off more of a spa-like vibe. Either decision has the potential to be stunning, and both leave ample room to showcase your personality and creativity. Whether you’ve got enough space for his and hers sinks and a clawfoot tub, or your powder room is a glorified closet, there’s always room for the perfect bathroom color scheme. From paint to tiling and delicate accents, here are seven beautiful bathroom ideas to help inspire you. Choosing a colorful, patterned tile is a great way to add a splash of the exotic to an otherwise neutral bathroom. 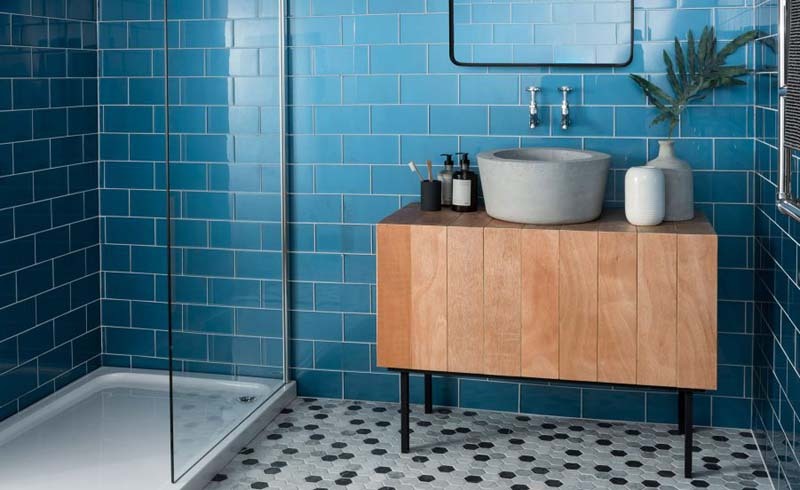 Instead of this gorgeous geometric pattern overwhelming the space, it is used in bursts, weaving into the sky-blue chevron pattern of the subway tiles. Above the backsplash, simple white paint compliments the white toilet and tub, creating a clean yet vibrant look. White bathroom color schemes might not sound over-the-edge exciting, but the beauty lies in the details. Large wall tiles pair nicely with the small style on the shower and bathroom floor, creating a greater illusion of space and texture. A sense of warmth is created by the wooden vanity with large, white sink basin and rustic black fixtures. Finally, splashes of greenery hung high in the room breathe additional life into the space. Black, white, and bold, these geometric backsplash tiles could be the perfect bathroom design accent. Eye-catching tiles look great when incorporated into small bathroom color schemes, but it’s important to go simple with other design elements. Here, they’ve offered a bit of respite with the addition of a stunning, gold fixtures, as well as a black and gold geometric mirror. White subway tiles complete the rest of the bathroom so as not to overpower the geometric design. Jazz up simple white walls with a bohemian bathroom color scheme. Albeit a narrow space, this blue vanity looks fresh and bold in its surroundings, enhanced by sleek black hardware. The addition of a colorful kilim rug atop starburst tiles gives the room a warm, cozy feeling. Don’t normally think of bathroom color schemes centering around wood? Think again! This sauna-like bathroom design is both modern and inviting, and streamlined by the various shapes and textures of wooden elements. Larger wall and ceiling tiles (and a killer skylight and shower head) are juxtaposed with thin wood floor tiles that elongate the space. Wooden shelves and small white planters give this shower room a woodsy feel that is sure to nourish the soul. It’s a fact: Green and pink work fabulously together. Green is a naturally a warm, soothing color, and there is no better accompaniment to this refined floral wallpaper than the pop of a pink clawfoot tub. The gold hardware and towel rack add warmth to the two elements, giving the bathroom a cozy yet sophisticated cottage vibe. This sleek and sophisticated bathroom is all about the balance of gold and gray. 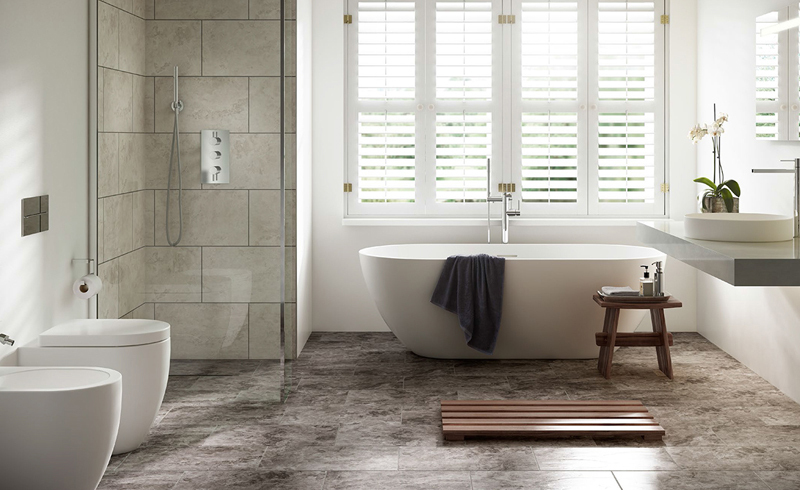 By choosing cement gray for both the vanity and patterned floor tiles, the room feels instantly light and airy. Adding gold hardware, mirrors, and lighting keeps the room from feeling plain. Together, the colors truly pop.